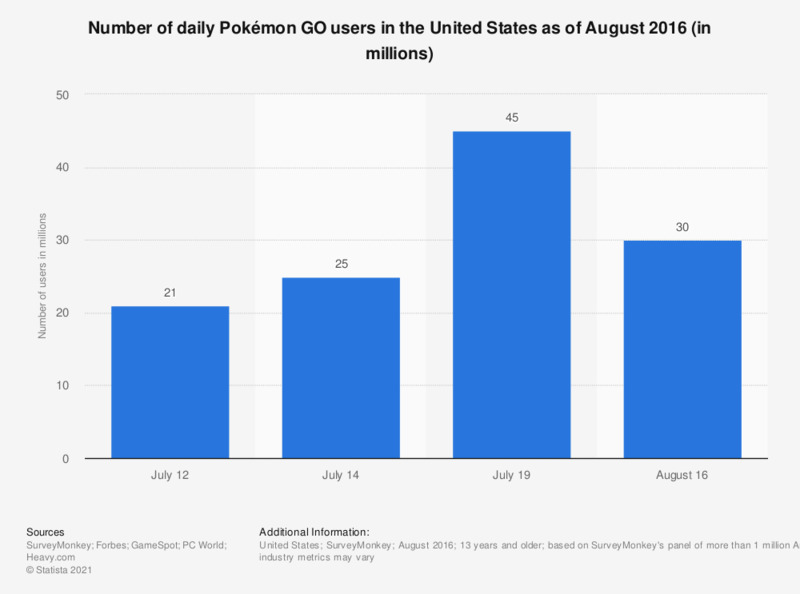 The graph shows the number of Pokémon GO users in the United States as of July 2016. Shortly after its release, the game had 21 million daily active users in the U.S. and the user numbers peaked on July 19, reaching 45 million. On August 16, 2016 Pokémon GO had 30 million DAU. Pokémon GO has become a global phenomenon in a few days’ time after the launch of the app by Nintendo in July 2016. The game remains incredibly popular in the United States, with a vast majority of the population having at least heard of the app. It was calculated that Android and iOS revenues generated by Pokémon GO in 2016 in the United States reached nine and six million U.S. dollars, respectively. By 2020 these number are projected to grow to 45 and 30 million U.S. dollars. Soon after the game was introduced on the market, there were almost twice as many women as men playing the game in the United States. Nearly half of the Pokémon GO users were aged between 18 and 29, a generation that was brought up during the 90s when Pokémon was first introduced to the public. Around 20 percent of users were between the ages of 13 and 17, while six percent were over 50. Furthermore, users between the ages of 25 to 34 accounted for the largest group prepared to spend money on in-app purchases, followed by 18-to-24 year olds who made up 16.5 percent of Pokémon GO in-app spenders. Figures for periods other than July 19 and August 16, 2016 come from previous reporting.